Nothing beats cuddling with your pup in front of the fireplace. But as good as that sounds, winter brings unique challenges both for pets and pet owners. Even if your dog is a cold-loving breed, you need to make sure that you take extra care during the winter. Pay extra attention to paws: Watch for signs of damage to paws due to extremely cold Even if the paw pads don’t get frostbite, the wet and cold can lead to cracking. Moisturizing can help. Be sure to dry off your dog when you come inside, paying extra attention to their feet. 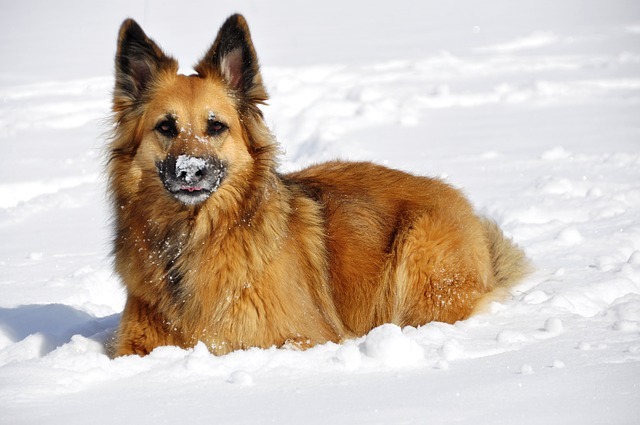 Limit outdoor time: Even dogs with thick fur can suffer from temperatures that are too cold. Don’t leave your dog outside unattended for long periods of time. It’s best to accompany your dog outside when temperatures drop since you’ll be able to judge whether or not it’s too cold. When your dog needs playtime, try to go out when the sun is shining. Take advantage of pet pads: If it’s too cold and wet to go outside, pee pads such as WizSmart can be a great alternative. Be consistent with where you place them and offer them as an alternative for pets that hesitate to go out in the snow. Pads are also a great alternative if you aren’t home and are concerned that your dog sitter may not know what to look for to keep your dog safe in the cold weather. Provide ample bedding: Floors can get cold so be sure to provide plenty of warm bedding for your dog. Sweaters and booties are also good alternatives for helping your dog stay warm. Watch out for heaters: Your dog may be tempted to get a bit too close to heat sources like radiators and space heaters. If you need to put up a barrier to ensure your dog doesn’t get burned don’t hesitate to do that. Without a doubt, the best thing you can do to show your dog a little extra love during the winter is to have a plan in place for both your dog and your home during this cold season. Get your own WizSmart training pads so that your dog remains comfortable and has a back up plan for some of the coldest days of the year. Your dog will love you for it!